A 1918 home undergoing renovations to bring it into present time called for the new kitchen to be the center of the plan. The new kitchen space was previously a bedroom, and a closet with a low ceiling was to be removed. Unfortunately, the closet was under the main stair landing, so the ceiling height could not be altered. To combat this design restriction, kitchen designer Gegg Design & Cabinetry used the space to build a double oven into the wall. A wide soffit was added over the cooktop wall to fully conceal the structural obstacle. The soffit ended up becoming a featured detail because two other structural beams were required and all positioned at the same height, thus creating a soffited or coffered ceiling detail on all four sides of the room. The double height of the ceiling is layered in lighting. The only wall cabinets in the room are at the desk area and store the homeowners’ dishes and glasses in drawers of multiple heights finished in stained walnut on a flat center-panel door. In the hall just beyond the ovens, floor-to-ceiling cookbook storage was created in dead space. 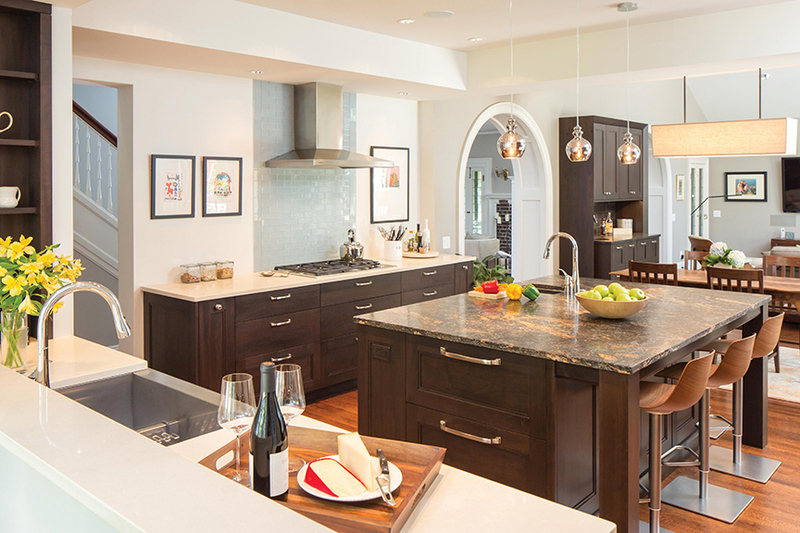 The countertops are light quartz with a dramatic black-and-gold granite island. The designer achieved a creative use of space, and the thoughtful details complete the look. 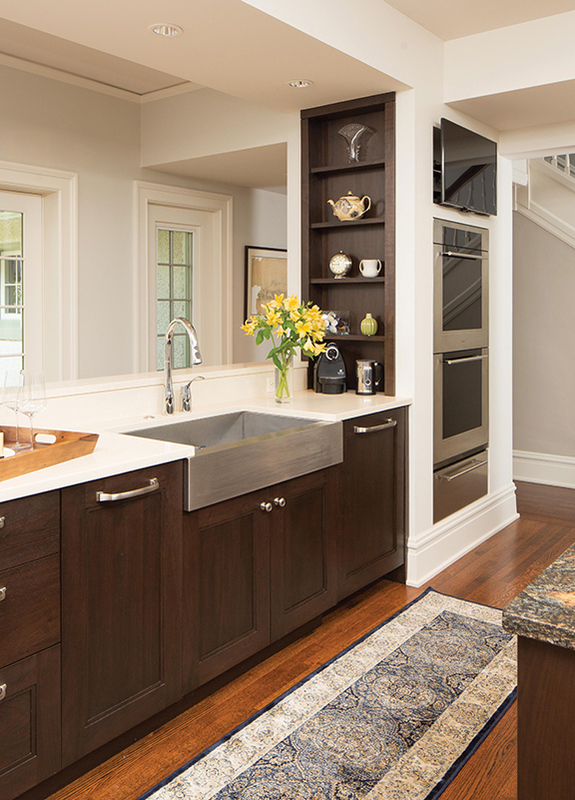 We love the built-in bookshelves and stainless farm sink.